Now that you have the submarine you can explore a new dimension of this second world. The submarine acts exactly like the boats in the first world, though it can also submerge and wander around underwater. Considering the size of the map this doesn’t offer as many extra options as you might think, but there are still a few things you can do. The top-left box opens up a room with a switch that opens up a passage elsewhere. It’s otherwise a dead end. The top-right box opens up on a dead end. Shrug. The bottom-right box also opens up on a dead end. Double shrug. The bottom-left box leads to a large room that appears empty, though if you head to the bottom-left corner of the room you’ll find a passage that leads to a switch. This opens a stairway into a series of small, connected chambers which will eventually take you to a turtle. This is Guido, and he’ll give you a Guardian Branch. With the Guardian Branch you can enter the next major area. Head to the western side of the western continent. There’s a small inlet you can enter which will take you inside a mountained-off area when you emerge from the water. The town of Moore is right beside the tiny lake where you emerge. There’s not a hell of a lot to see in Moore. There’s another piano in Moore’s pub, and just outside the pub are a pair of barrels, one of which contains a Main Gauche. The only other items of note here are the pieces of equipment you can buy, in particular the spells. Moore’s offerings are the next step up in firepower, and will make all of your Mages exceptionally powerful. Moore is your next destination, and we’ll look at it shortly. Before heading in, though, there’s one last place you can make a stop. Follow the coastline from Moore to the north a ways, dipping underwater. There’s a debarking point on the western side of the next continent up that will take you into a tiny cave. Beyond this is a penned-in forested area. 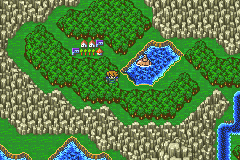 The only thing you can immediately find here is a Chocobo Forest to the southeast, where a female chocobo lives. Keep her in mind for later. Despite this area seeming useless it does serve a purpose. Wander around in the forests for a while and you’ll eventually run across Catoblepas, a summon boss. Though it has low health - 4,000 HP, barely a pittance - Catobelpas can cause a lot of trouble, as its Evil Eye counterattack can immediately petrify one of your characters. Mash it with your absolute strongest attacks, and use Esuna or Gold Needles to heal petrify as necessary. Defeat Catoblepas for the Catoblepas summon. - Enter the Forest and approach the small gap in the bushes to the north. With the Guardian Branch in hand you can proceed. Head almost straight north through the trees to find a chest containing 2,500 gil, then turn east and walk as far right as you can go. There’s an Ether beside the east-most tree. - Beside the Ether is a tree with a hole in it. Check the hole to open a pathway into the ground. Go through and it’ll take you into another area. Head north, sticking to the right, and you’ll find 4,900 gil in a chest. Skim along the northern wall, heading east, and you’ll find a Phoenix Down in a small clearing. Grab it and turn back south, then carry on east as far as you can go. Once you hit the eastern wall, turn north to find a chest containing 9,500 gil. - One small clearing over from this last chest is another tree with a hole that opens a passage. It comes out in, yep, more forest. To the left of the entrance is a chest containing a Cottage; to the right is a Goliath Tonic. Wander north from the Tonic and you’ll see a save point on your right. Check the west wall for an Elixir as you head north; in the far north is a Morning Star. - West of the Morning Star is a cut scene that will set the forest ablaze. Once you regain control, check to the north of your starting position to find an Aegis Shield snugged up beside a tree. Stand around here long enough and the ground will open up; hop inside. You’ll find moogles below, as well as restorative water. Wait for a few moments, then talk to the moogle by the door to move him out of the way. - The poor forest has been burnt down. Sigh. If you didn’t open the chest with the Aegis Shield before, you can open it now to get a Flame Shield instead. Wander west a ways and you’ll see a chest containing Ash; further west is a Flametongue. - If you head south from the Flametongue you’ll wind up on the world map. To the north is a massive tree, as well as a cut scene… and a boss fight. I recommend saving, ‘cause this one can be tough. Ouch. This is harsh. Each of these Crystals is elemental in nature, and will correspondingly absorb their respective element. The top Crystal absorbs fire; the right Crystal absorbs water; the left Crystal absorbs wind; the bottom Crystal absorbs earth. All four are immune to electricity, ice, and poison. Normally they just smack your guys physically, which is bad enough since there’s four of ‘em, but once you get a Crystal down to roughly a quarter of its total health it will start to use an all-hitting magical attack, typically doing in the range of 600 HP apiece. Even one of them doing this is enough to wipe out your party within a turn or two. The key, then, is to save your absolute strongest attacks until the last possible moment, when they’re around 2,500 HP or so, then go to town with the best you’ve got. Take them down one-at-a-time in this manner. Getting rid of each one will make the overall job just a bit easier. Alternatively, try and wipe them out all at once, saving a ridiculously strong attack for last. The best candidate in this case is the Samuria ability Zeninage, which can do around 5,000 HP of damage around this point in the game, unless you’re over- or under-levelled. Don’t use this move right away, however, as it probably won’t kill the things - but it’ll do enough damage to put them in their second, more deadly state. Only use it twice in a row if you have two Zeninage users. Mind, too, that you need looooots of money to use Zeninage effectively.